There are many different digital literacies relevant to language: (texting, print, gaming, mobile, multimedia, code); others with a focus on information (information, search, tagging); those that relate to connections (personal, participatory, network, and (inter)cultural) and remix. The last of these Gavin illustrated by showing a video of Tony Blair and George Bush's love song. In the current age, we need to take all of these into consideration because they are part of the skill set that people need and in some ways, as Gavin mentioned, educators are now preparing people for jobs that currently don't exist. Mobility is now one of the key factors and the shift to handheld devices has now started to have an impact upon what many teachers now do in class. Despite this, many of our students perceive that there is a gap between what happens in the real world and what happens in the classroom. 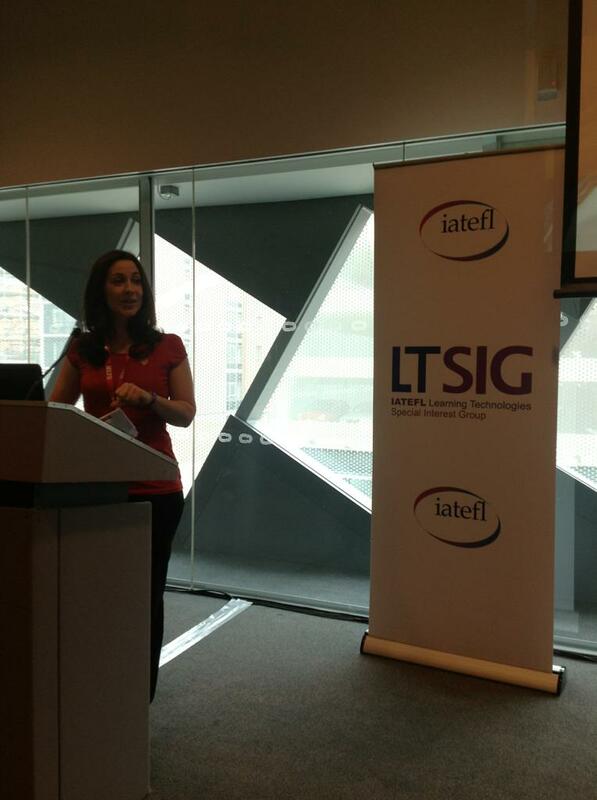 Burcu Akyol and Luke Meddings were the final speakers of the LT SIG day. In December they led an 'Unplugged and Connected' course in Istanbul that explored how dogme and technology can enhance and reinforce each other in the classroom. 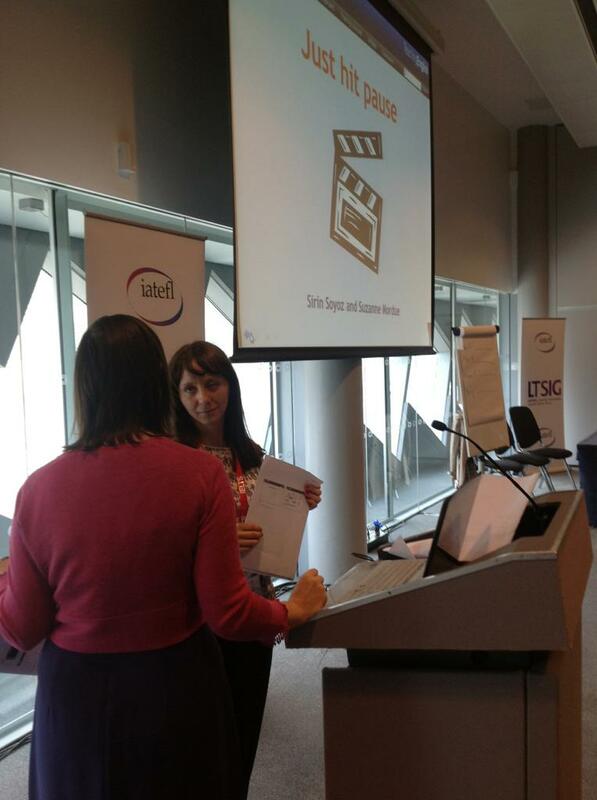 They shared reflections and outputs from the course in this session - and shared some practical classroom ideas. Luke started by giving an overview about teaching unplugged and this was followed by Burcu talking about how Dogme ELT affected her approach to teaching when she first came across it. Burcu is an enthusiastic user of learning technology too and she has reflected on how technology and teaching unplugged can be combined to benefit both learners and teachers. Burcu talked about the importance of PLNs (Personal Learning Networks) and how teachers who connect with other teachers in this way an benefit. Luke asked whether being connected was necessary and stated that the two approaches, teaching unplugged and connected teaching can be used separately, but when they taught their course in Istanbul, they asked participants to think of where the connections between the both may lie. Luke talked about how the debate about the use of technology has now moved on and he talked about the early efforts of educators about blending Dogme and technology (Dogme 2.0) and how things have changed since then. Indeed, so much has changed it is often difficult to understand what a different world it is that we currently live in to what it was. Luke took blogging as a particular example to how powerful connecting locally situated learning and also looking beyond borders. He suggested that this type of connection is very compatible with Dogme. One particular problem is that there are so many different tools to choose from, and Burcu shared a checklist with the audience to help us decide which technology to use. The questions on this digital handout (check for it on the IATEFL Liverpool online website) is something that every teacher should keep in mind. Burcu then began to show a number of practical ideas and tools that teachers can use, such as Evernote (https://evernote.com/), LinoIt (http://en.linoit.com/) and ScoopIt (http://www.scoop.it/). Burcu talked about using Evernote as a repository for digital portfolios and online student notebooks. This powerful tool has lots of different features that some teachers and learners may not be aware of and she recommends people explore the tool more deeply than they at first may have done.Burcu also mentioned a number of other tools that are compatible with Dogme such as Edmodo. Luke finished by talking about the interesting connections that were made by participants on the Istanbul course and other ideas that came out of it that we're both related to constructivist knowledge co-creation and technology in the classroom. Paul Driver, who has been nominated for an ELTon for his game Spywalk, started his presentation by sharing his love of drawing architecture whenever he visits a new city. Whenever he does this, locals often come over and talk to him, telling him their life stories and talking about the place. There is an inter-twining relationship between people and the cities they live in. Showing a map of New York, Paul talked about trying to understand. City by looking at an aerial view. Maps, Paul stated are things we often think of as objective, but maps are never objective, they are always subjective and show things that the map-maker decides to show. Maps have often been used for propaganda devices. Talking about memory and identity, Paul reminds us that memory is often augmented in many different ways - through written notes and latterly, our phones, and even things like smells and tattoos. Our memories are also shared with family and friends, often distributed among a number of different people. Memory I Ali embodied and embedded. If you look at movies, for example Memento, you can see examples of this embodied memory, with the main character, Leonard, who suffers from memory loss, uses photos, notes and tattoos as aids o his memory. Nowadays there is often a fear that we rely too much on our phones and other devices to remember things. For instance, know many people in the audience now know their own telephone numbers. Many in the audience recognized that they didn't. We are now often experiencing the world nowadays as it is presented to us through our screens. The new aesthetic movement has emerged to categorize and critique this change in society. An example of this is the "cell trance" and the "obsessive checking" of mobiles for messages. Adam Bartholl's change project (http://datenform.de/) is another example of how the digital interfaces with the real. The yellow arrow project is a new form of city markup that sees people post yellow arrows on things they think are culturally relevant. Another interesting project is guerrilla gardening - a hands-on approach to improving the spaces where we live. Guerilla gardeners reclaim land (http://guerillagardeners.org) and plant food or flowers to improve quality of life. 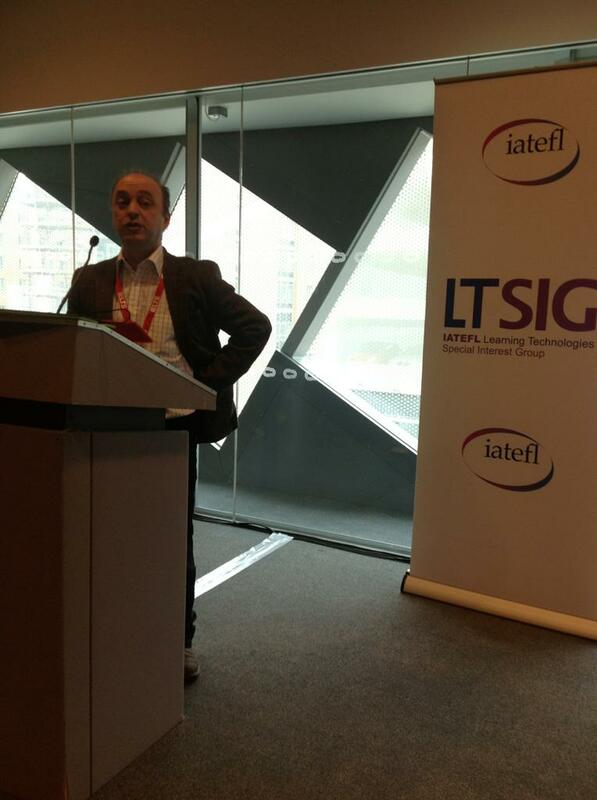 The IATEFL ltsig Diana Eastment / Travel grant scholarship winners this year are Dimitris Primalis and Chryssanthe Sotiriou, who work in schools that have class sets of tablets. The speakers first showed 2 examples of literature and asked the audience to think about the following: Layout, lexis, length of text, visual aids, learning styles, skills. Next, half of the audience were first asked to listen to an excerpt of the film (http://i.imgur.com/ywKjqEw.jpg) Rebecca while the others blocked their ears. After this those who blocked their ears were asked to watch the same excerpt of the film without sound. The audience then shared notes and talked together. The idea of doing an activity like this is to stimulate learner interest. The speakers believe that this is the only way to get a ten year old boy to read a novel such as Rebecca. They use http://www.edmodo.com/ to stimulate the discussion and then in class afterwards they were motivated to read the book. Chryssanthe has used the site http://www.60secondrecap.com/ to help motivate the students. Here there are short videos about books and she has found it is very popular.the speakers have also used Skype in the classroom, inviting authors and other experts into the classroom this way. Dimitris also uses things like sounds to stimulate interest, first playing some sounds related to a paragraph from a book he wanted the students to read and following up with the actual book chapter (the Day of the Triffids, in this example). Chryssanthe finishes by emphasizing that you can integrate technology into your classroom by getting involved and getting Trainner and becoming engaged with it in order to share that literature is something that they shouldn't be scared of, that they can learn to enjoy and learn from. Lindsay Warwick also uses ideas behind the flipped classroom method in her own classes, but uses it in a different way to Stephen. Her focus is more on the homework aspect. She sees that some of. The benefits include students taking control of the learning process, it is very personalized and it helps the students to learn how to learn as well as enabling her to engage more in 1:1 learning. She has found that students are also more engaged with this system and in a 2012 study (Classroom Window) it was reported that 80% of students were more engaged by using the flipped classroom method. Lindsay started to use this method, but at first it failed. It failed because students had a lack of study skills and were also unmotivated. Lindsay was then forced to adopt a different approach that involved the students creating weekly objectives, checking each other's notes and setting individual deadlines. The 'naughty' students (i.e. those who hadn't watched the video) would be asked to watch the videos in class times, while the other students are involved in more interesting classroom tasks. This method means that the students quickly learn that it is better f or them to do the homework so they can use the class time more productively. Lindsay has found that she has time with this method to spend time to help those students without sufficient study skills and help them become better at learning to learn. The weekly objectives generally were set using 'can do' statements and gets them quickly working in pairs or small groups to discuss why these are important for them to learn how to do. She also gives them a checklist and the students tick the ones they think they need to know. This is used as the basis of the weekly timetable and it means the students feel the lessons are more relevant to what they would otherwise be. The weekly objectives then are explicit and they are shown how they can achieve them. Finally, the students are encouraged to talk about how they think they did. To get the students to watch the video, she usually gives them a teaser. For example, she shows the students an email and asks the students to say what's wrong with it. After hearing their answers, she neither agrees or disagrees, but asks the students to watch the video to find out. Another option is using a screenshot from the video, for example, Lily's surprise (http://m.youtube.com/#/watch?v=RY9kJEurNZo&desktop_uri=%2Fwatch%3Fv%3DRY9kJEurNZo ), encourages the students to watch the video and makes the videos more engaging. Lindsay uses the method with a pre-intermediate class at the moment and has started a line of progression starting it off in class and then moving towards the students doing more at home. This seems t o be working so far, and the students are becoming better learners too. Her next step is to add an element of peer teaching into the process. Stephen Bukin's is the first of two Flipped classroom presentations during the LTSIG day. Stephen started by talking about the origins of the flipped classroom with Bergman and Sams in the US and the now well-known Khan academy bei the fore-runners. Proponents of e flipped classroom believe that this model helps struggling students and often helps with poor students. Stephen also believes that it helps over scheduled students. Why flip your classroom? The model of schoolwork and homework was based on the requirements of the Industrial age and it may be about time for a change. Stephen started by looking at his own classes and analyzing his own lessons. He is a traditional PPP.teacher but he felt that the students were not getting enough practice in his previous teaching model. Another problem he had was continuous enrollment and with new students entering his classroom all the time, often with different levels, differentiation was difficult. This was why he thought that a possible solution was the flipped classroom model. Using this model frees up the classroom time and allows a teacher to have more one-to-one time and can be more student-centred because the students decide how much time to spend on each video. He decided to start by making some demo screencast recordings and he collected feedback from the students and then reflected on the lessons and on what worked well with the videos that received the best feedback. Although there's nothing wrong with putting a video camera in the classroom, Stephen decided to use screencast software. He started wi Jing, but this has now been discontinued, so he has switched to http://www.screencast-o-matic.com/. Two other tools that you can use are http://www.brainshark.com/mybrainshark and http://www.screenr.com/, although these last two do not let you to share your webcam, which Stephen likes. Another tool Stephen likes is http://present.me, which shows a split screen with a video of yourself on one side of the screen and PowerPoint slides on the other. For teachers with iPads, http://www.educreations.com/ is a nice tool. It can also be used on the Web too as it is cross-platform. Explain Everything is Stephen's favorite iPad app. It allows you to use images and move them around on screen in interesting ways and can also be used with students. Despite these useful tools, it is not about the video, but actually the extra time using the videos frees up in the classroom. There seems to be a lot of anecdotal evidence that this method does help with deeper learning in interesting ways, although not much research is available at the moment. 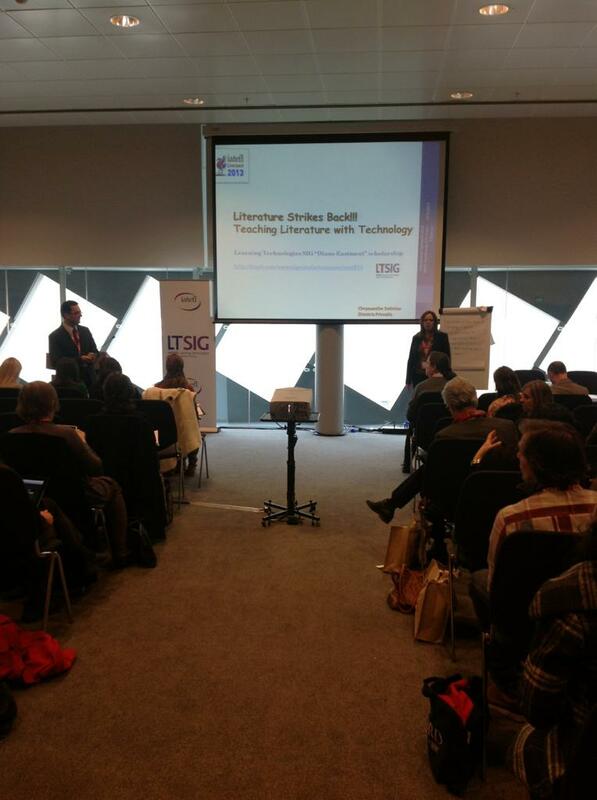 The second LTSIG day presentation by Suzanne Mordue and Sirin Soyoz was dedicated to video in the EFL classroom. Sirin said she is interested in video because of the multiple channels that it allows and particularly emphasises the potential of Youtube, but because YouTube is not available in some countries, Vimeo and Videojug are two alternative video sharing sites that have general videos. Top documentary films, TED talks and National Geographic are some other channels for specialized videos at you can use with your students. 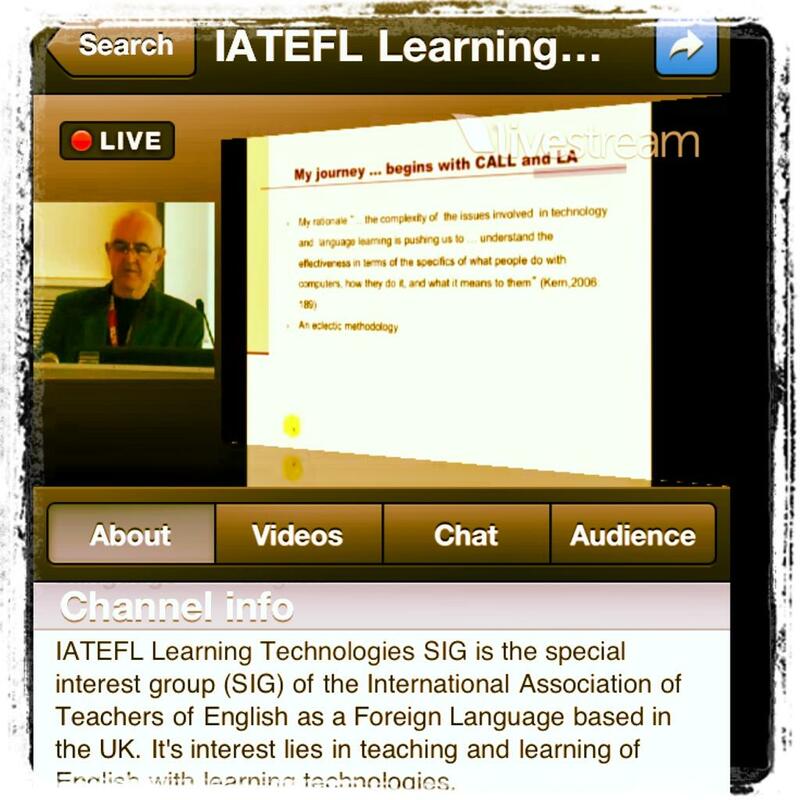 As far as ELT specific, Real English (http://real-english.com/) Randall's video snapshots (http://www.esl-lab.com/videoclips.htm ), ESL Video, Simple English videos and LearnEnglish Teens are all sites with good sources of different videos. Sirin and Suzanne then shared lots of different clips and discussed how best to use them in the classroom. 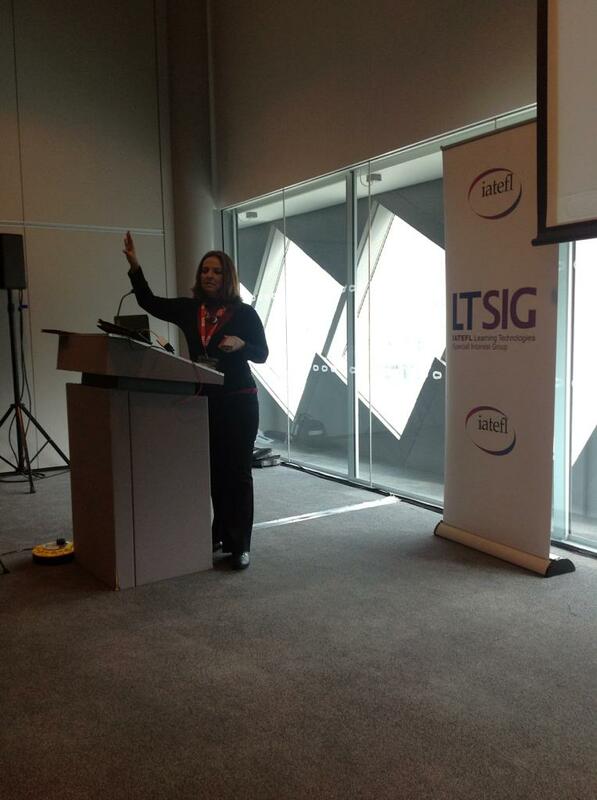 Carla Arena's presentation at IATEFL was all about digital curation. Carla started by looking at art curation, talking about the role of the curator as someone who gives meaning to content by selecting the best of a body of work and presenting it to the public. Libraries, churches and newspapers also all have lots of content and a curator to help them present content. Asking the question, 'What has changed in content curation?' Graeme Hodgeson answered that it is now bottom-up, with people everywhere on the Web now curating content for others, and filtering information for different specialized audiences. Carla mentioned 'Too big to know' by David Weinberger (http://www.toobigtoknow.com/about-2/) and the question 'what happens to knowledge and expertise now that we are faced with the fact that there is way way way more to know than can be known by any individual?' The hypothesis of the book is that 'knowledge and expertise are becoming networks, and are taking on the properties of networks' and digital curation, with networks of people finding and filtering through digital curation. One of the first tools Carla introduced was Flicr galleries, which allow people to curate other people's photos. Another tool, http://cowbird.com allows for digital storytelling and Carla thinks that the most exciting thing about this tool is the idea of 'sprouting' a story, using your network and writing a story with students that include engaging, authentic content. Mentor mob (http://mentor mob.com) allows a teacher to create learning playlists for students, so it can be a useful tool to use for homework or in class. Learn list (http://learn list.com) is a similar tool that allows for learning playlists to be created/curated. The same is true of http://theemefy.com, which enables you to create a magazine for you or your students that can be read online or downloaded. The book can be shared with others. Another popular tool that many educators are using at the moment is http://scoop.it. An alternative to this is htpp://trap.it which allows the content to be pulled to you depending on a series of search terms that you decide on. You can do this with an iPad app or online. Flip Board is another app that can be used (in Mac iOS or Android). Zite is another app that Carla finds interesting. Finally, Carla shared a few links such as Edutecher that allows educators to find out the latest tools and information related tools. Victoria's session on handheld learning started by looking at the considerations that teachers and schools need to make when considering the use of handheld learning. One of the first decisions that has to be made is which device. The audience was first asked to discuss the pros and cons of different options (class sets of tablets, bring your own device) and Victoria asked us to discuss the benefits and problems of implementing these decisions. Obviously, BYOD (Bring Your Own Device) is cheaper, but not all students have the same devices, so the kinds of things you can do and which apps, etc you use will depend on this. Having a class set of tablets ensures everyone using a similar device, but then teachers need to consider things such as security, payment options (for apps, etc) and it can become an expensive option. 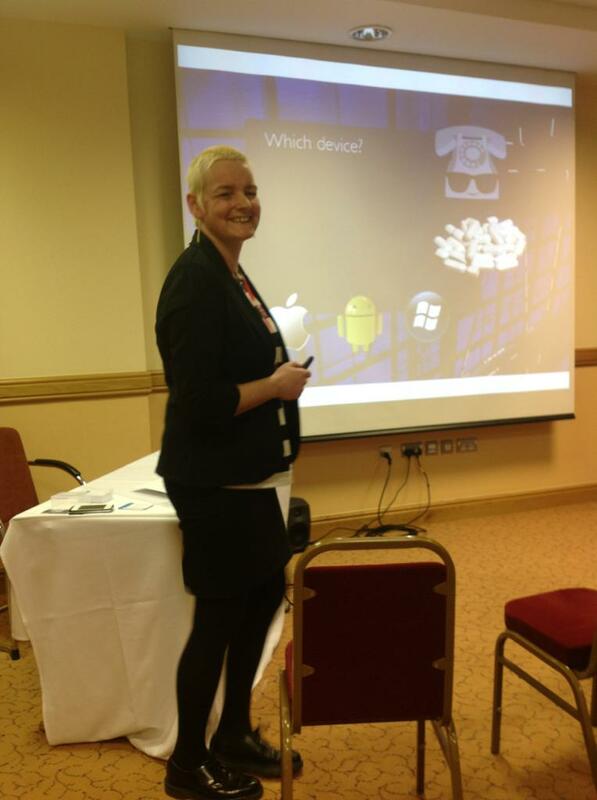 As far as security is concerned, with iPads, Victoria mentioned having to look at worries of device theft and breakage. Victoria's school's solution was to lock the ipads up when not is UNE and to use the app 'find my iPad'. Setting restrictions on what can be bought or changing email accounts is important (eg nobody except Victoria can access the code to buy apps). Buying a durable cover for the tablet is important too, and in a year, the school has not lost a device and neither have they broken one. Apple will also etch the back of the iPad (for free) with the name of your school and number of iPad, etc. Maintenance is around an hour a week, and then updates to apps take time too, but Victoria deals with this by taking turns to update each device. Maintenance also includes how/where/when they are charged and by whom. Which new apps to buy is also a consideration. When charging them, Joe Dale suggested using a plate rack to keep them separated and if they are all stored in the same place and charged together that will save time. Ongoing teacher training is important. Victoria has found that top-down teacher training hasn't worked. Considerations involve finding out if teachers are tech comfortable, and if they aren't, then try to help them feel better about using the technology. Apple also trained all of Victoria's teachers for free. Other things to think of is how often training is done. Once a week for 20 minutes has proven to be popular, initially Victoria did the training and now the teachers are teaching each other how to use the apps, etc. Teachers could also take the iPads home to play with and this helped them feel better about using them. Apart from the device, and more importantly, responses from teachers show that the iPads are being used in ways that add to the learning, practice and recycling of language. The students also have given very good feedback about using the iPads in a variety of ways to increase their use of English. The next part of Victoria's presentation was looking at how the iPads are being used in class, and she started is by showing a video made with iMovie by the students of one class of a poem that they had written and then put to images. Photo comic is an app which is popular with both teachers and students. He asked teachers if they were confident about using the laptops and how often they used the computers. He found the teachers he asked were not using the computers as much as was first thought. One of the problems he found was that a lot of teachers feel overwhelmed, and what teachers really need to know rather than how to use the technology, is how the technology can be used to enhance learning. Nicolas promotes the idea of partnering pedagogy, as suggested by Mark Prensky, as the way forward. He also thinks that the idea of the computer as a source of motivation is worrying and he thinks it needs to be what the teacher asks the learners to do that should be the source of the motivation rather than the actual machines themselves. The role of the student was also examined by Nicolas, and he identified a number of roles, such as investigator, technology expert, content recipient, etc. the key to success, he feels is letting the kids find and follow their passion. He also believes more should be made of using whatever technology is available, not just the laptops and the kids should also be researching and finding information, sharing thoughts and opinions, creating presentations in text and multimedia. The teachers need to be good at creating and asking the right questions, giving students guidance, putting material in context, creating rigor, ensuring equality and explaining one-to-one. Partnering pedagogy should be about student centred learning, problem and project based learning, case-based and inquiry-based and task-based learning. Nicolas believes that we are in an interesting moment to implement this and that the computer should just be one more tool that a teacher can use to help her teach the students. The most important lesson from the places where OLPC (One Laptop Per Child) has been implemented is that you cannot ignore training and teacher development. Paul Woods of the British Council spoke about it being vital if the project is to be successful, although there are experiments by people such as Sugata Mitre (Hole in the wall project) that claim to have success by just giving kids access to the technology. It's also what you do with the device that makes all the difference. Nicholas Negroponte has also said that OLPC is all about empowering children through education. There are 1/2 million XO laptops in Uruguay and many other laptops all over the world including in Nepal, Afghanistan, India, Rwanda, Madagascar and Argentina, Venezuela and Peru. Research has been done during these projects, with results reporting greater learner satisfaction, and highly engaged learning taking place. Criticisms in Argentina have been: lack of connectivity and problems over maintenance when Ines go wrong. Paul Woods then talked about the Plan Ceibal project in Uruguay, where he is involved as Programme manager of the English teaching, and he showed a video about the project,which is proving to be very successful. A humorous moment occurred when an interview with Paul appeared in the video and he seemed to be wearing the same shirt! In Uruguay, Paul has found that the British Council have been writing materials to use on the laptops and for the remote teaching. Every 9 weeks the students are doing tests, and the results of these have been very positive. The project the British Council is expanding quickly and results of the pilot have shown that many of the kids have taught their parents how to use the laptops. Paul finished by showing a fabulously cute video taken by a teacher, of two kids demonstrating the English that they had learnt. Questions from the audience included questions about software (Linux), and whether money would have been better spent on teacher training in the country - there was a concern, and the British Council have told the Uruguayan government that they should be doing this too. In this session, Michael Carrier spoke about the benefits of adopting a Programme of 1:1 handheld devices in the classroom, starting by talking about the OLPC (One Laptop Per Child) programme. Michael quoted Nicholas Negroponte, the founder of OLPC: "What children lack is not capability, it is opportunity and resources"
Michael spoke about the places where these 1:1 learning is being put into place, and where it is showing success. 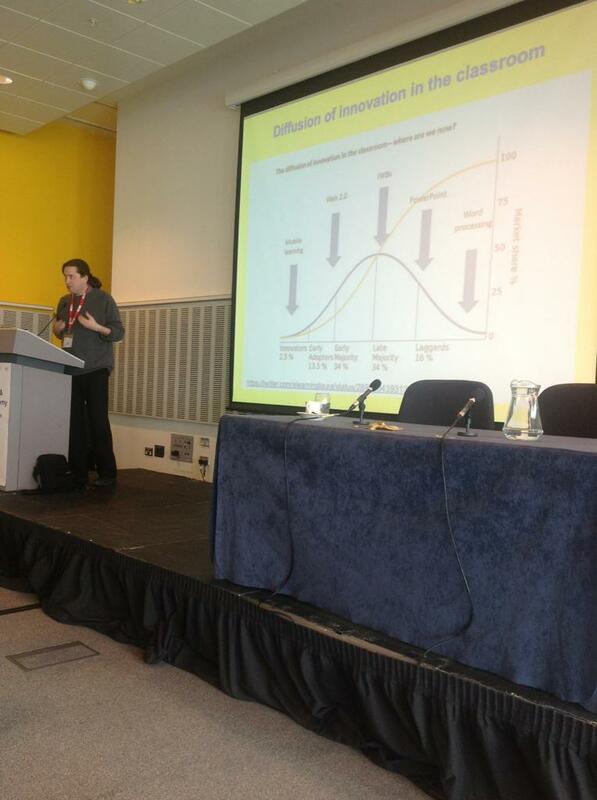 He also spoke about places where the programmes have not been so successful. The reason why many of these projects fail is well known, according to Michael. It is usually due to not investing in teacher training and teacher development, which means the teachers do not feel involved or comfortable using the devices in the classroom. In many places where 1:1 programmes have been successfully implemented have seen some very positive responses from children, teachers and parents. Uruguay and the Plan Ceibal is the world leader at the moment, and Michael spoke about the work the British Council is doing in Uruguay using teleconferencing to help the children learn English because the country does not have enough trained English teachers in primary schools. In order to make is work, Michael believes that new teacher competencies need to be developed, including e-moderation courses and he said policy development is also very important. The budget and setting aside money to invest in teacher development is so important in determining the success of these projects, and Michael called for more teacher training courses to be developed to help teachers develop the skills they need to be able to teach in these new contexts. To finish, Michael looked at what's happening next, including new models of publishing. Questions and comments from the audience included a man who asked how you can use this type of learning in a very large class, and how it can be evaluated. Michael responded that more research needs to be done and teachers need to try out different models to allow for this, conducting action research. One way of dealing with large classes, for example, is to get the children working in groups. Another important feature of many of these programmes involve using a Learning Management System to support the learning taking place. Michael also believes that there will be new careers opening up for teachers with so much online learning and teaching taking place. Dario Luis Banegas spoke in this session 'Learning English through remote learning' about e British Council's role in Plan Ceibal, which has rolled out XO laptops to all Primary aged children throughout Uruguay. Dario spoke about his role as project manager and how one of the key aspects for him is the relationships between the different roles (lesson plan writers, materials designers, classroom teachers, remote teachers, e-moderators, children, parents and educational administrators). In the project, classroom teachers in Uruguay are supported by remote teachers, mainly in Argentina in order to teach children English. Video conferencing is used to transmit the image and sound of the remote teachers into the Uruguayan classrooms and the classroom teacher facilitates. The lack of English of most of the classroom teachers is the reason why this is done, but the classroom teachers are undergoing an English Programme in tandem, supported by e-moderators, who also talk to them via Skype and help with the planning of lessons. Dario showed videos of actual classes in progress and spoke about the challenges and successes of this interesting project, which is increasing in intensity this year from 250 lessons a week to thousands across the country. 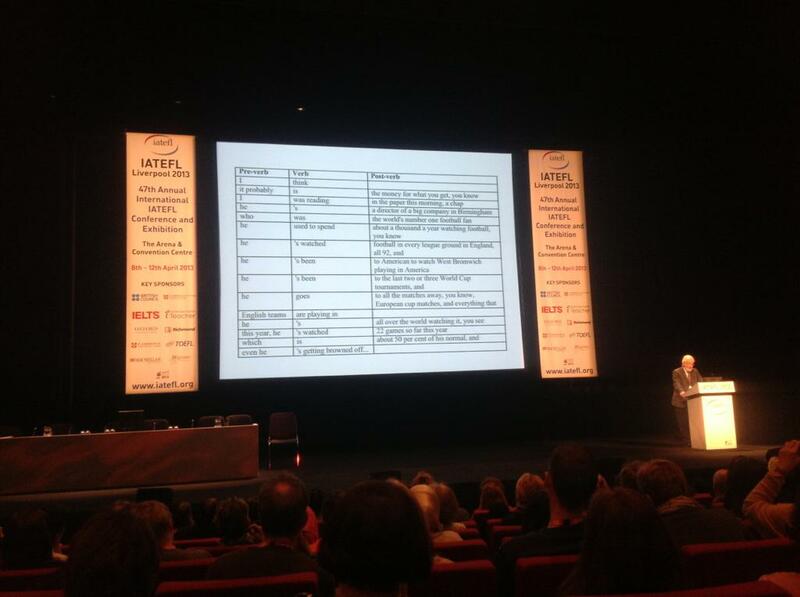 David Crystal's very entertaining opening plenary at the IATEFL conference in Liverpool started with a line from Paul McCartney's song 'Live and let die' (the blog post title) that contains a double preposition. He then looked at other examples of this in newspaper reports and popular media. David Crystal also looked at other examples of non-standard grammar, including double negatives in Beatles songs. David then told the audience that 'blends' such as 'within how long did it take...' , a combination of 'within what time period' and 'how long did it take' also occur in lectures and he then proceeded to use examples from his own recorded lectures that showed everyone ends up doing this in speech. Examples of blends rarely appear in public writing, usually, because it is the job of the editor or copy-editor to rephrase any blends that are found. However, some blends do slip through the net. On the Web, in particular, there are examples to be found in social media, Wikipedia, blogs, etc. 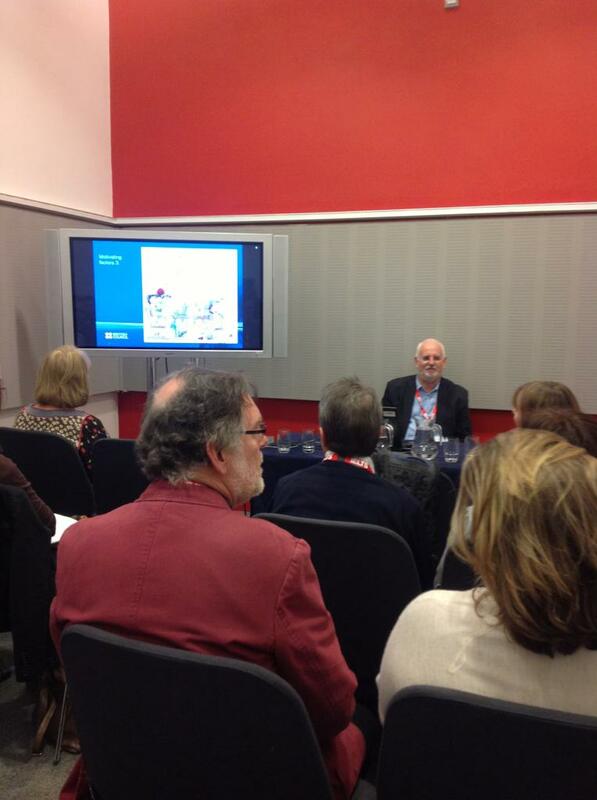 Taking examples from the top UK blogs, David Crystal showed examples of blends. The next point David Crystal made was that grammar helps people remember things, and he showed us with examples of strings of numbers of one then two syllables. He also showed examples from ELT, including writing from a 15-year-old. Over the next week, there will be opportunities to watch (live and recorded) a number of other presentations from the conference as well as interviews of those taking part. 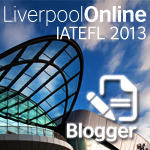 The recording of David Crystal's plenary and the follow up questions can be found below and on the IATEFL Liverpool Online site, http://www.iatefl.org/liverpool-2013/liverpool-2013. Joe Dale started his rapid-fire presentation off with information about information about the changing world of technology, with the proliferation of mobile devices and the rise of the Martini generation (i.e. learning any time, any place, anywhere) meaning educators need to pay more attention to possible uses of mobile devices in the classroom. Joe shared a list of different ipad apps he recommends for language teaching and learning, and also recommended a book by Chris Smith (http://aneducatorsipad.com/) for any educators looking to use iPads in the classroom. 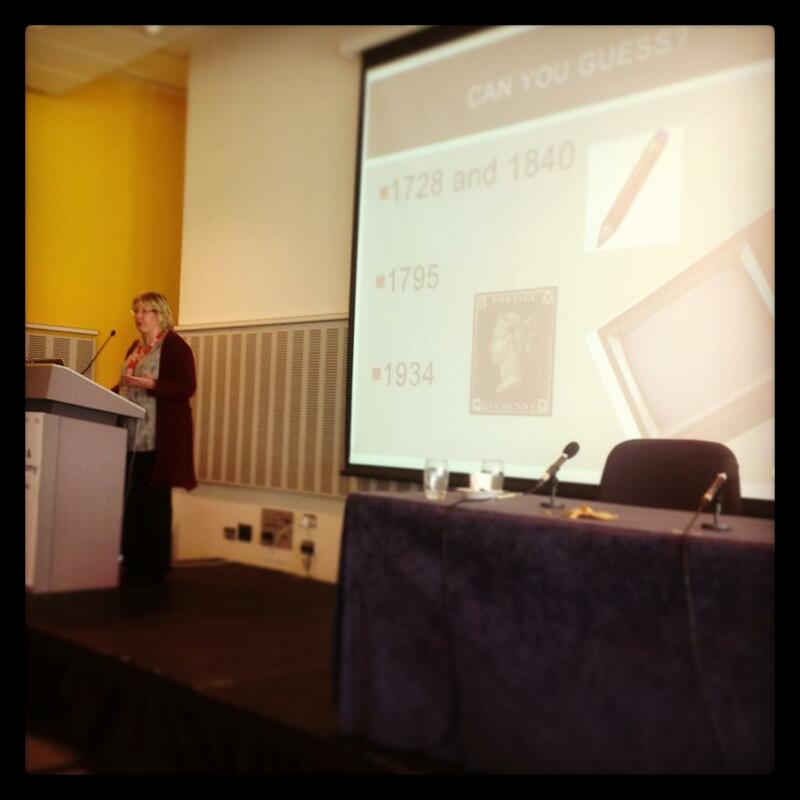 http://keldarichards.wordpress.com/2011/07/01/le-mur-parlant/) makes of QR codes for her 'Making your walls talk' stood out as an innovative way of making use of them in the classroom. 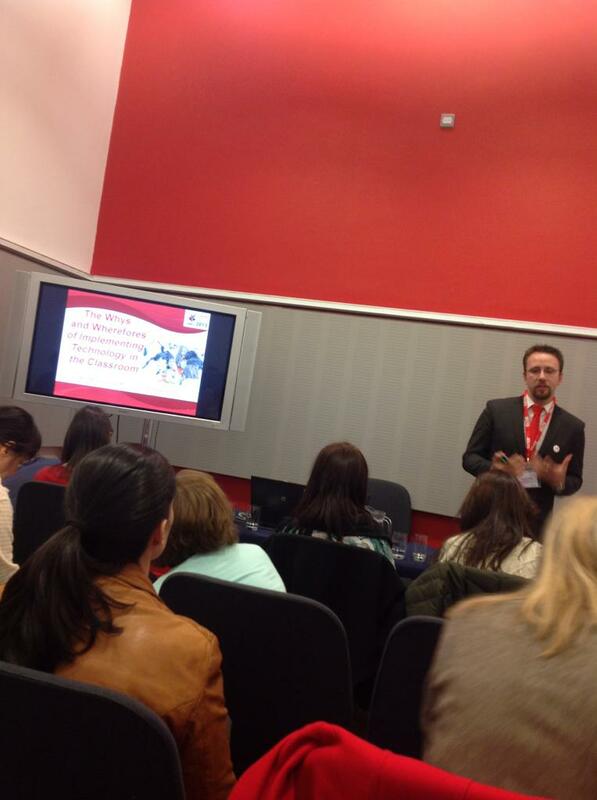 Joe mentioned a number of different sources of evidence of the value of using iPads in the classroom. one of the first suggestions from Kristina was that the teacher should start by considering the culture of the learners, considering the interaction between content delivery and deeper learning, individual and social (i.e. group work), teacher led and self directed learning online. One of the issues that Kristina cam across with one group of teachers that she worked with was that they were not allowed to ask the children they taught personal questions, because it was an invasion of privacy and it might embarrass some of them. When it comes to the environment a teacher teaching online should consider the learners, the other stakeholders (the school, the management, etc). Digital literacy is another issue with some of the teachers Kristina works with, and some teachers do not know how to copy and paste a URL or how to take a screenshot. The key to dealing with this is patience and not making assumptions, helping the teacher in different ways (how to videos and PDF instructions). Kristina uses http://www.screenr.com/ to make instructional videos for the teachers. 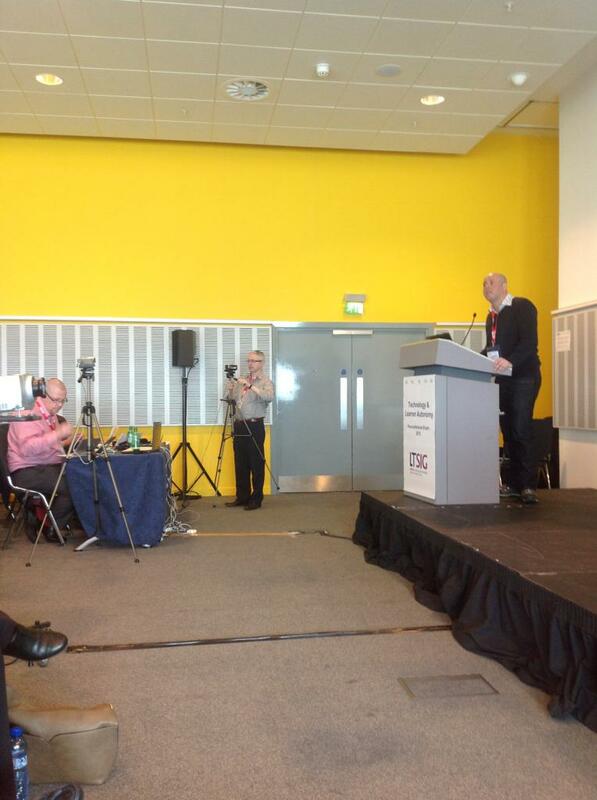 The photo shows, live from Liverpool, Paul Braddock talking about the Flipped Classroom and leading a discussion about what it is and the pros and cons of reversing the role of what you ask learners to do in class and what you ask them to do at home (see http://en.wikipedia.org/wiki/Flip_teaching). One early definition of the flipped classroom was the idea to invert traditional teaching methods, delivering instruction online outside of the class and moving "homework" into the classroom. Paul said that this definition of the flipped classroom adheres to a behaviorist view of teaching and learning and perhaps it is more suited to a subject with content rather than teaching a language. One point made by an audience member was that, as a student of literature, she was asked to do a lot of reading at home, and what she ended up developing was the skill of being able to talk about books without having read them. She said that the danger with our students is that they end up doing something similar and then not getting the input. A more updated definition has the flipped classroom 'providing initial input outside of the class' and 'promoting more output in the classroom', which Paul says is more relevant to language teaching and learning. After setting the context with a look at the history of Learner Autonomy and CALL, and assumptions wrongly made in this area, that paper-based material is no longer preferred, that learners no longer like self-access centres (SACs), Huw presented research showing the move learners are making (from CALL to MALL). It is no longer about explicit teaching and learning, or just realized in SACs, but learners are routinely multi-tasking and are more and more informally connecting with other English speakers using social networks such as Facebook and Twitter. Often this communication is based on hobbies (football, gaming, etc) that learners share. Huw shared Stephen Krashen's 1982 research that distinguishes between learning, which is conscious, and acquisition, which is unconscious. 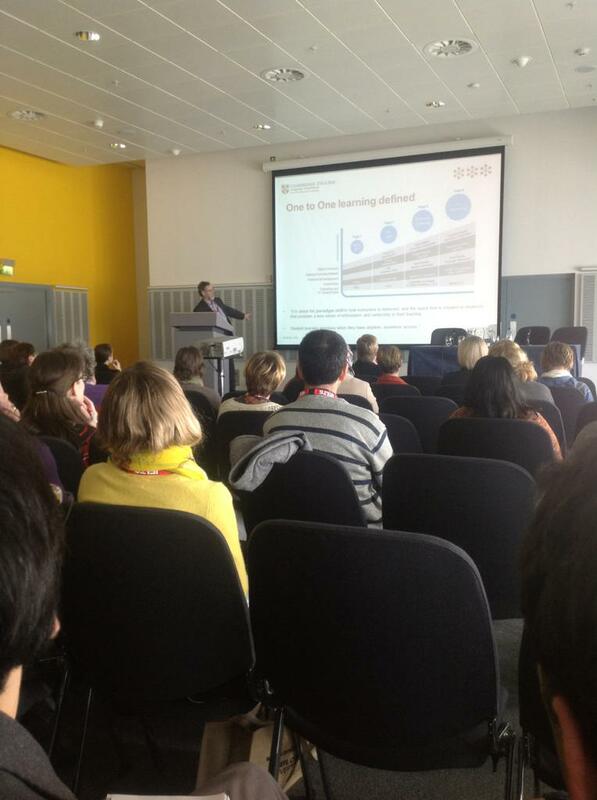 Both, Huw believes are personal, social, academic, global and mediated through a range of digital devices. The rise in informal learning and mobile devices are the keys to understanding how learner autonomy and technology is changing. 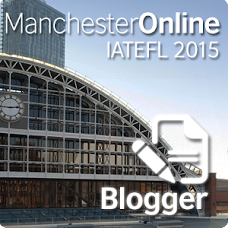 I've just signed up to be one of the IATEFL Liverpool Online registered bloggers, which means I can repost video content from the 47th annual IATEFL conference on this blog.